Hello, and welcome to Prison Architect! This quick start is meant to guide you through the creation of your very first prison, step by step. Before starting this guide, it is highly recommended that you complete the campaigns first. Especially the introduction (Death Row) will familiarize you with how to interact with the prison and the various interface elements. Thus, this guide assumes some basic knowledge of the core game. This guide is not the best or only way to create a prison! The beauty of the game is that any configuration or order is feasible. This guide will only teach you how to build a rudimentary prison with only the very basics. If you desire more information on a topic, or strategies for more advanced prisons, please follow the links to the appropriate item. To create a new sandbox prison, bring up the main menu by pressing [ESC], then select the Create New Prison option to display the following dialog. 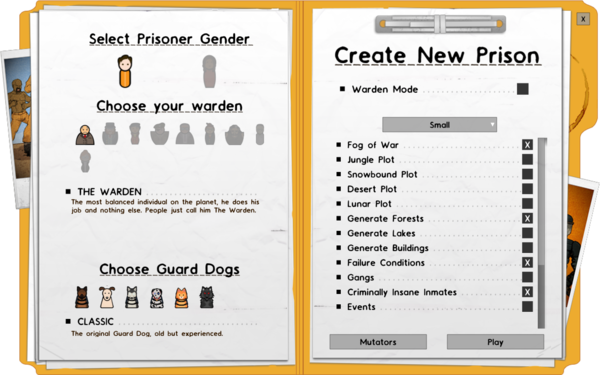 This dialog contains an array of options which can be used to customize a new prison. Details about these options can be obtained by mousing over them or in the article Sandbox Mode. The default options offer a balanced difficulty level. As the map loads, press Space to pause the game and have a look around. Unlike in the campaigns, you are given nothing to start with, save for $30,000, eight workmen, some basic supplies, a delivery zone, and garbage depository. Everything else is up to you. This may seem daunting, especially since you need to get a basic facility up and running for your first prisoners. The first prisoners will arrive in 24 hours, if you don't change this in the Intake report. With $30,000 to start out with, you have adequate funding to build only the most basic prison. Luckily, the government has offered five starting grants to give you some funds to work with. To claim a grant, click on the reports icon in the lower right hand corner of the screen, and select the "Grants" tab on the left. Simply click on grants to accept them. Grants offer cash upon the completion of certain objectives, in the form of a Completion Bonus, while most also offer an Advance payment, received after accepting the grant. There's no penalty for not fulfilling all of the items on the checklist, however you may only accept two grants at a time (extended to three through the accountant). You can raise your balance to around $55,000 immediately, more than enough to build a robust prison, if you accept Basic Detention Centre ($20,000 Advance Payment) and Administration Centre ($5,000 Advance Payment). The tasks required to complete these grants will usually be the first two tasks you complete. Be careful, though: while $55,000 may seem like a lot, it will run out quickly if you don't make smart spending decisions. If an item is not necessary to the functioning of your prison, then don't buy it! Set up electricity and water utilities, which are the lifeblood of your prison. Don't forget to add capacitors as the power station will run out of juice quite quickly. Build offices for the prison administration team in order to start researching along the bureaucracy tree. Create a holding cell, which can house large numbers of prisoners in a single room, and is cheaper than building individual cells right away. Build a canteen and kitchen to provide food service to the prisoners. Remember to hire at least a few cooks to prepare food. Build a shower so that the prisoners can satisfy their need to be clean. Build a yard and/or common room to allow your prisoners to pass the time. Create an Infirmary to heal injured prisoners and staff. Construct a method of securing the perimeter of the prison in order to prevent escapes. Fences are only $3 per square and are built quite quickly. Pace your construction. Allow one foundation to be completed, the room to be allocated and furnished before starting the next item, otherwise you might end up with unfinished areas, as the workers scuttle off to begin the next new job. Every prison needs electricity and water to function. A generator needs to be connected to various appliances via cables. If the generator alone cannot provide enough power to your entire prison once it grows large enough, its output can be increased with capacitors. Sinks, showers, sprinklers, and toilets all need to be hooked up to a pumping station with large and small pipes. The pumping station itself also needs an electrical connection. To make expansion easier and keep the costs of cables and pipes down, place the generator and pump station in a central location. This also allows for the ability to control the flow of utilities to different areas of your prison—switches and valves can be used to cut power or water to a specific area, such as a damaged or unfinished cell block, or an electric chair when it is not in use. Two generators can not be connected together and one will short circuit and shut off. Use switches and multiple generators to build in redundancy in-case of emergencies. There are various staff members you can hire to carry out certain tasks, such as administration, security, maintenance, financial management, and health. From the start, only a few staff members can be hired—workmen, guards, cooks, and the all-important warden. Once he is on your staff, you are able to start researching other staff members through the bureaucracy system. By far the most important members of your staff (at least for the time being), the six administrators can research additional staff members to help make your job easier. Each administrator needs his or her own office, a 4x4 room equipped with a chair, desk, and filing cabinet. The Warden: Only one warden can be hired. The warden will research the other members of the administration team, who can then be hired to research staff members or abilities that apply to their respective positions. The warden also allows access to the regime report, where you can alter the prisoners' daily schedule and the quality of their meals. The Accountant: The accountant gains access to government grant programs for extra funding, allows you to go over your daily operating budget as long as your balance is high enough to cover the difference. She opens up the finance and valuation reports where you can take a look at your spending versus earnings, and assess the value of your prison, from physical plant to safety. The Chief: When the chief is hired, he is able to research the ability to set up security cameras, deploy guards, and create patrol routes and a lot more. The Foreman: The foreman oversees the day-to-day maintenance of your prison. He can supply access to the cloning tool, to easily duplicate areas such as cells, and he can research cleaning staff to pick up after your prisoners, both inside and outside. The Psychologist: For an inside look at your prisoners’ mental state, hire the psychologist. He prepares the needs report, and breaks down what each prisoner wants in a handy bar graph. It will show how many are hungry, tired, scared, bored, and so on. The Lawyer: When the lawyer is hired, he grants access to a variety of legal loopholes and helps you bend some of the rules for greater control over your prison. Workman: You start out with eight of these indispensable employees. Workmen build new buildings, install furniture, take in deliveries, put out the garbage, and make simple repairs. Guard: Escorting prisoners, finding contraband, and patrolling the halls are the main responsibilities of your guards. The more the merrier, as prisoners always need supervision, because otherwise they will try to sneak knives from the kitchen, dig escape tunnels, get into fistfights, and destroy the fixtures in their cells. Only guards are able open jail doors, so those guys are important. Cook: Prisoners are human, and they need food. Cooks take care of unloading shipments of ingredients, cooking food, serving meals, and washing dishes. The more inmates you have, the larger a kitchen and cooking staff you will want. Doctor: Prisoners will injure themselves, others, and staff members whenever they’re in a bad mood and are presented with the opportunity to do so. Doctors can heal up anyone who has an injury, and if a case is particularly bad, send them to the medical ward for care. Janitor: Armed with a mop and a desire to clean, janitors are not essential, but a great addition to your team unless you like your floors covered in cracks, footprints, and algae from broken toilets (you can thank your prisoners for that). Gardener: Gardeners are like janitors, but they clean outdoor areas of your prison and chop down trees. They are probably the least important people on your payroll, unless you are very invested in chopping down trees to sell or refine the wood. Dog Handler: Armed with dog leash with a vicious dog that is able to sniff narcotics or smelly contraband. When a fight break, he and his dog will attempt to stop it. Dogs will also kill prisoners who knocked unconscious or killed their handler. Armed Guard: An advanced guard who is armed with a shotgun to shoot prisoners on sight if told so, easy to stop fights or riots. Armed Guards are able to enter controlled areas. Individual cells are expensive, and with limited funds, building a large, communal holding cell is more cost effective. Holding cells require only a bench and a toilet, although some beds are recommended as the prisoners will start getting restless after they had to sleep on a bench for too long. While the prisoners will seriously miss their privacy, you will be saving money that can go towards building fully-fledged cell blocks. Even though the inmates have done bad things to be sent to your prison, they’re still human and need food. To keep the prisoners’ food needs in check, you will need a Kitchen to prepare food in, Cooks to do the actual cooking, and a Canteen for the prisoners to eat in, or they will just take their trays back to the showers or their cell, making cleanup that much harder for your staff. The kitchen requires a Cooker, Fridge, and a Sink. Place more than one of each, if possible. All of the appliances require a direct utility connection, so plan your kitchen carefully to save on cables and pipes. Your canteen needs to be outfitted with at least one Serving Table, Table and Bench to start. Serving tables offer a place where clean trays and pots of food are stacked. The prisoners will serve themselves. Tables and benches provide places for the prisoners to sit and eat. Benches are to be aligned parallel to the table(s) in order for it to be effective. Each bench can sit four prisoners. In the Policy report, you can alter mealtimes and adjust the quality of the food. To keep costs low, reduce the variety of your menu and reduce the amount of food the cooks prepare. However, this will lead to unhappy prisoners who may not get to eat because there isn’t enough food. The default schedule’s mealtimes in the Regime report are also not ideal. Adjust it to give your prisoners a meal in the morning and one at night. Additionally, keep mealtimes limited to one hour. It’s plenty to keep your inmates’ tummies full. Your prisoners love taking showers. Regardless of their reason, how nice the shower is, or if they are given all day to do it, prisoners will always complain of being dirty. Make sure the room is large and open, because if word has come down that someone is to be shanked, it’ll most likely occur in the shower. Around the edges of the room, place showerheads (they need a water connection) and install drains near the entrance to prevent the entire prison from flooding. It’s best not to schedule a specific shower time and allow the prisoners to shower whenever they want to during free time, in order to keep the number of inmates in the shower down and reduce the potential for violence. The United Nations insists that your prisoners be provided with some activity to keep them occupied. They can use the facilities in the yard or the common room, which you should outfit with weight benches, phone booths, pool tables, bookshelves, and televisions. Doctor! Doctor! When your prisoners get too angry they will start to harm staff and other prisoners, guards will then try to incapacitate them and then handcuff them if successful. The prisoner will then be taken to the infirmary by a guard (note that a guard can also take other guards to the infirmary and staff will go there automatically). Once there, a Doctor will heal them in a Medical Bed and they will return to their regime or cell. Idle doctors will also come to this room. The requirements for an infirmary are currently at least one Medical Bed. What else could hold the stereotype for prisons if it weren't for barbed wire and chain linked fences. To make sure all of your prisoners stay where they should and stop them from running to the forest you should place Perimeter Walls around the perimeter of your buildings. While using a jail door as the front door to your prison seems a no-brainer, it will cause some delays as guards will constantly have to run and unlock it for each non-guard staff member that wants to pass through. To solve this, install a staff entrance; place a staff door leading from the deliveries/garbage plots into your main prison and connect it to a trap room (a 4-6 block long hallway) with another staff door on the other side. Flag the trap room as "staff only" in deployment and you're done. The entrance will allow staff members to pass freely into and out of your prison while preventing prisoners (especially janitor-prisoners) from making a break for the woods. Thanks for reading this basic Prison Architect guide! Refer back to it as necessary and share your newfound knowledge by contributing to it or the tips page. Once you have completed this list you should add some cells and go deeper into the game, eventually adding a workshop, a laundry and everything else Prison Architect has to offer. Enjoy the game, and good luck!